"Fatherhood is great because you can ruin someone from scratch!" 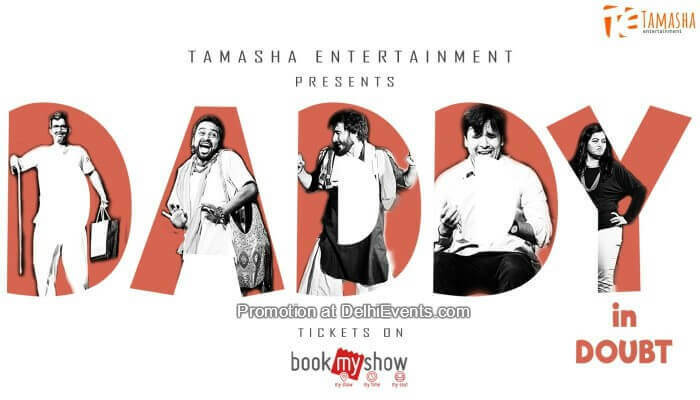 Based on the very famous play Baap Re Baap by KP Saxena. This is a laugh riot bought to you by Tamasha Entertainment. What happens when your Daddy Runs away from your House. Come join us to figure out how this mad Bhatnagar Family tries to find their lost Daddy and how they end up in Doubt! About the Organization : Tamasha Entertainment associates with the revival of theatre and curating of a gateway to artistic expressions which can be enjoyed by the audiences from diverse segments. Tamasha is a belief, a commitment and promise to the institution of creative expression. We build our shows with a lot of love and bring forward some of the most mesmerizing expressions for our audiences. The idea is to make the experience of engagement with theatre more accessible and less obscure. Thus through our shows we showcase the beauty that can be created on stage through the exquisite set designs, engaging performances, enticing use of lights and music ensuring that what our audiences take with them is an experience of a lifetime. We also have our own studio located right in the heart of Gurgaon near Galleria market which is currently a hub for curating and experimenting with different art forms pertaining to theatre. The vision is to develop it into a space dedicated to research and bringing in new technology for stage and theatrical performances.